If I was a bird, I think I'd be doing my best to get dibs on a modern birdhouse like this one. Jumahl of Upper Marlboro, Maryland is the mastermind behind this idyllic aviary abode. But this modern camper isn't built for just any bird. The hole size, just 1.5 inches, attracts primarily bluebirds, tree swallows, wrens and sapsuckers. Jumahl offers some sage advice, "It is important to put these in deep shade so the metal top doesn't turn them into solar cookers." 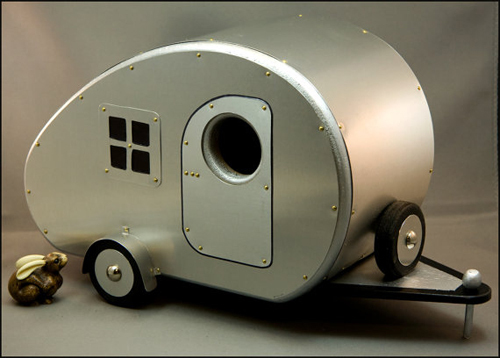 And it's best to take good care of your camper house as Jumahl has certainly taken the best care in handcrafting them. As he explains, "Even though most people prefer to display these indoors, i do go to the expense ($125/sheet) of using marine grand Okoume plywood from a local lumber supply store, which is both sustainable and weather resistant, for durability outside, along with exterior enamel paint." Marc Ellis of Charlotte, North Carolina handcrafts some really beautiful birdhouses from a variety of wood to increase texture and depth. This one, called Wave, is made from South American Canary, African Padauk and American Maple. All of Mark's birdhouses are eco-friendly. The materials used are salvaged scrap wood and all glues and finishes are water based. Mid Century Modern is one of my favorites. I love the combination of wood textures and I just know my backyard birds would be fighting for prime position in this swank hangout. Thanks for sharing your amazing handiwork Jumahl and Marc. We so appreciate your passion... and great taste.